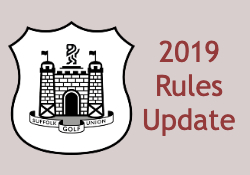 Don't get caught out by the 2019 rule changes - we've put together a digest of the best articles from the world of golf to help you get to grips with the new rules. The R&A have put together this short article and video on the '20 Must Know Rules of Golf Changes for 2019'. Click here to view the article. Golf Monthly have put together an 'All you Need to Know' Guide. See more here. Read up, and make sure you know the rules.